Purchase tickets here or by phone at 514 842-2112. Founded by René Rozon and now in its 33rd year, Montreal's International Festival of Films on Art (FIFA) is a non-profit organization devoted to the promotion and presentation of the finest productions on art and media art. Festival dates are March 19-29, 2015. Click here for the entire schedule of films for the festival. The spirit of revitalization that comes with a New Year seems to have extended into the art world. Open since the second week of January, the Paul Kasmin gallery presents “The New York School, 1969: Henry Geldzahler at The Metropolitan Museum of Art.” The show is a re-creation, albeit a miniature one, of the curator’s legendary show “New York Painting: 1940-1970,” colloquially known as “Henry’s Show.” The reason for the show’s status in the memory of the art world of New York is its revolutionary nature— as head of the newly-created Department of Contemporary Arts, Geldzahler was able to showcase the museum’s first contemporary show, taking over a huge portion of the museum space. The show was an instant hit, generating buzz throughout the city and helping to highlight artists whose works have now entered a canon—including that of Andy Warhol, David Hockney, and Hans Hofmann. The legacy of Geldzahler is perhaps lost on those who did not get to witness his show and its impact at the time of its exhibition. The Paul Kasmin Gallery reintroduces his work to a new audience and in the new, very 21st century, setting of a Chelsea gallery instead of the sprawling and stately Fifth Avenue museum. Rather than taking over 40 museum galleries with contemporary art, the Kasmin show features 29 works in only three rooms. Yet the pieces featured were clearly chosen to be exemplary of the range in which Abstract Expressionist art could manifest, and are carefully arranged to echo the powerful influence of an expert curator. The first room immediately sets up a sense of lightness and humor that is carried throughout the show and indicative of the era. Large canvases adorned brightly and boldly with paint hang one after the other. 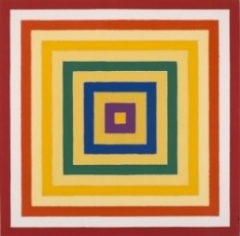 Frank Stella’s Scramble: Ascending Spectrum/Ascending Yellow Values unapologetically tackles the familiar image of the rainbow while across the space Adolph Gottlieb’s Sign minimalistically gestures at something between a figural image and calligraphy. In the middle of the room, Art Box by Robert Rauschenberg helps the viewer out by labeling itself a “WORK OF ART” in block lettering on a worn wooden case. Moving through the second and third rooms, one is exposed to a greater sense of motion. Z by Jules Olitski depicts a sweeping green curve, like a warped exclamation point, across a yellow canvas. 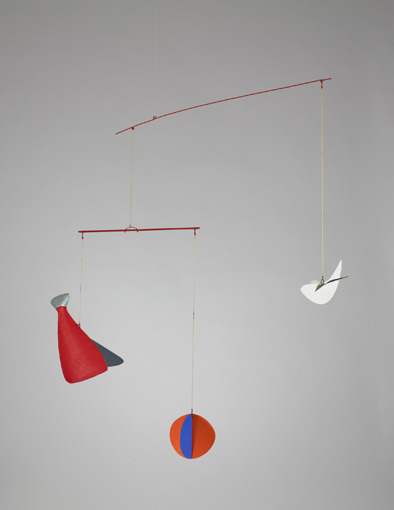 One of Alexander Calder’s famous mobiles, The New Ritou, spins slowly overhead. The excitement is increased by the inclusion of recognizable names, including two works by Andy Warhol. The show, though brief and presented somewhat starkly in the contemporary gallery, demonstrates effectively the intense range of art being produced in the mid-twentieth century. Though all the artists were living and working in roughly the same time and place, their work is varied and speaks on different levels and about different things. The beauty, then, in this show is that it still comes together cohesively, a nod to the skill and importance of the curator in creating clarity from a sea of great work. Though the art is what is on display for view, Geldzahler’s presence hovers throughout and the homage to him stands at the center. To learn more about Henry Geldzahler as a person and his influential work, check out our film “Who Gets to Call it Art?” http://www.musefilm.org/who-gets-to-call-it-art/.